If we are going to bring back the Hard Hittin’ Mark Whiten Memorial Player of the Week, it must to make a comeback with the week that Bryce Harper just closed out. No matter what Harper does from this point forward, he just closed out what was probably the best week of his career. 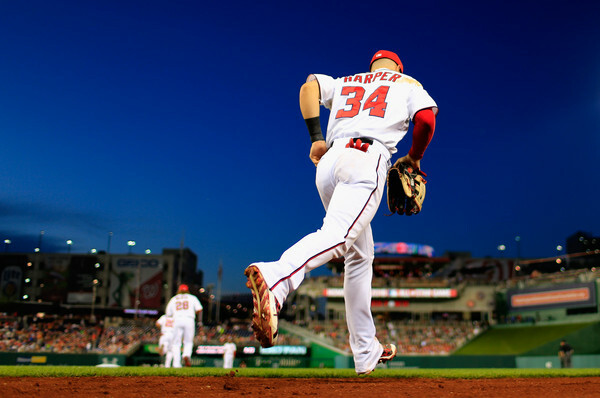 Displaying power to all fields, Harper had a three-homer game, a two-homer game, and a walk-off job in three consecutive games. Mixed in with all those damn homers were a bunch of line drives up the middle and through the left side. He also doubled 400 feet to center today and added another single. He’s just really hitting well right now – and the walks were already in the equation. We have ALWAYS really loved Harper, tantalized by his talents that he would show from time to time but frustrated that injuries and his own (understandable) immaturity was keeping him from tapping into this vast potential. A potential that we think could see him become a Derek Jeter type of ambassador of the sport; a guy that kids ask you about someday when you’re old (“you really saw Bryce Harper play in person?”). If you’ve been admittedly nervous about Harper’s development, it’s time to relax some. Barring injury, this breakout is real. Just watch him some night. He’s been having the quality at-bats all year long, his swing is perfect right now; and he’s staying on pitches a lot longer than ever before in his career. The homer binge should continue unless pitchers just decide it’s easier to go after Ryan Zimmerman and Wilson Ramos, which is a likely outcome. In that case, he’s going to achieve a .400 on-base and a .900 OPS in his sleep which at age 22 is what you call a star player. This will forever be the week that he announced his great presence in the game. It should never be forgotten.